What I have seen from Wilson this game are things that I’ve seen from him in other starts: He’s a runner with tremendous athleticism and fundamental skills, but occasional bouts of immaturity when it comes to applying the tools of his trade. One could have said the same thing about LeSean McCoy or Jamaal Charles when they were prospects – I know I did. If you agree that Wilson is a quality RB prospect and accept the fact that he has shortcomings to address before he becomes a consistent and productive NFL starter, then the question becomes “how long will his transition take?” I think one telling indicator is if a running back prospect flashes moments of NFL-caliber decision-making. Another is how often that back flashes these moments despite immature plays like the ones I profiled of Wilson in the previous post. I’m going to examine runs in this and the next post that I believe are good indicators for NFL success. The analysis in this post is a list of plays where Wilson shows some refined decision-making and skill. The next post will profile successful runs that might have been even more successful with better vision. I use the word “might” because the alternate options I’ll discuss are frequently riskier choices than the ones Wilson made. They are gray area decisions, but ones I’ve seen great runners make successfully. Wilson’s 11-yard gain on 1st and 10 with 9:38 in the third quarter was a display of good interior running skills for a back known to bounce plays outside. 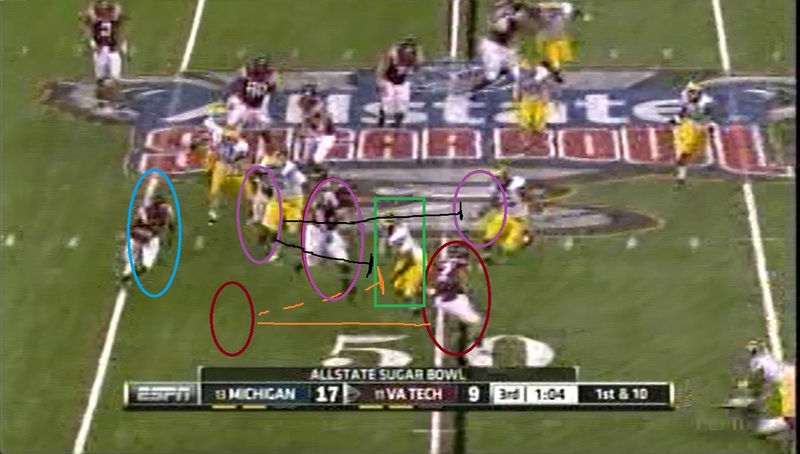 The play begins from an 11-personnel, 1×2 receiver, shotgun set against a 4-3 defense. Wilson flanks the quarterback to the twin receiver weak side of the formation and the play design is a run to left end with both guards pulling. Presnap look with basic design of guards pulling to left end in this 11-personnel, 1x2 WR set. Wilson follows his LG to the corner and does a good job of setting up his blocks. First, he gets close to the inside hip of the pulling lineman to avoid the pursuit from the defenders getting quick penetration into the backfield. The UM players highlighted with green squares get good penetration, but Wilson's speed and decision to accelerate to his pulling lead blocker - but not beyond him - is a good combo of decisiveness and patience that pays off on this play. It's a refined decision for a back sometimes lacking patience. 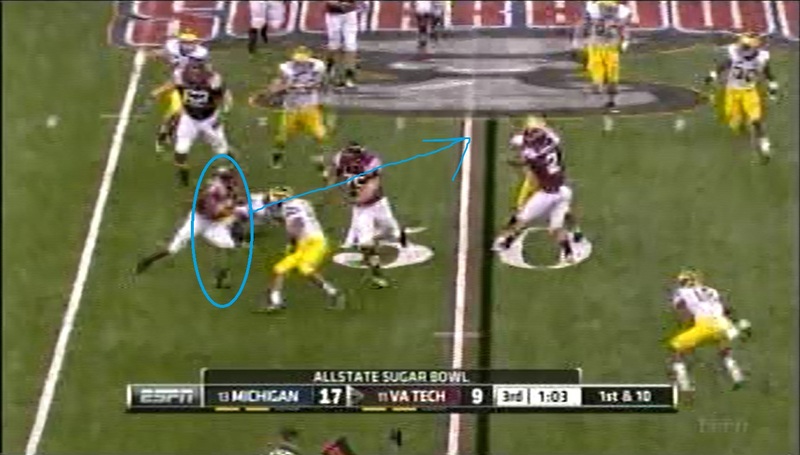 Next, Wilson presses the outside by veering towards the guard’s outside hip. This draws the CB to the sideline. Look at the previous photo to see the position of the CB I placed in the green square in this pic. Compare that position with the shoulder of the guard that Wilson is behind in each photo and you'll see the cause and effect. At this point Wilson dips side the guard and lowers his shoulder through the MLB, knocking the defender to the ground as he runs up the sideline for another seven yards. 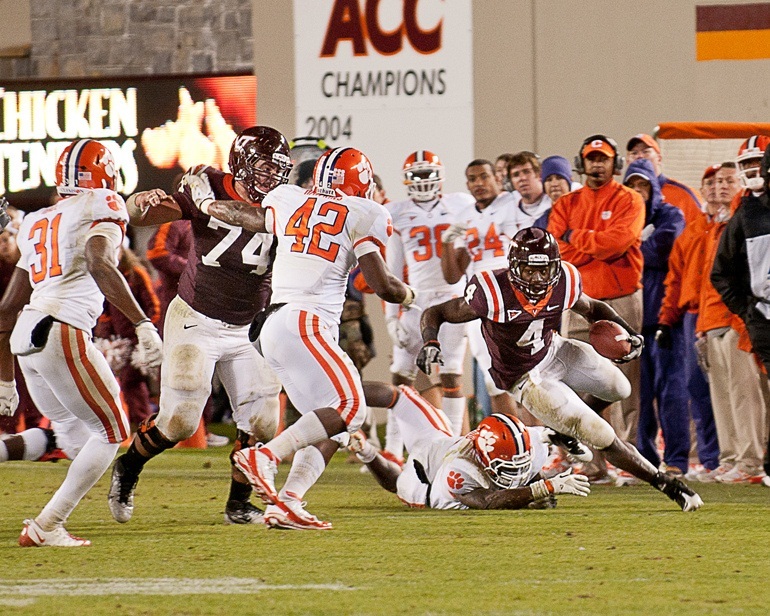 Note that Wilson is conscientious about carrying the ball under his sideline arm and this future marquee moment in the Va. Tech film room is an additional reason why this practice is encouraged. 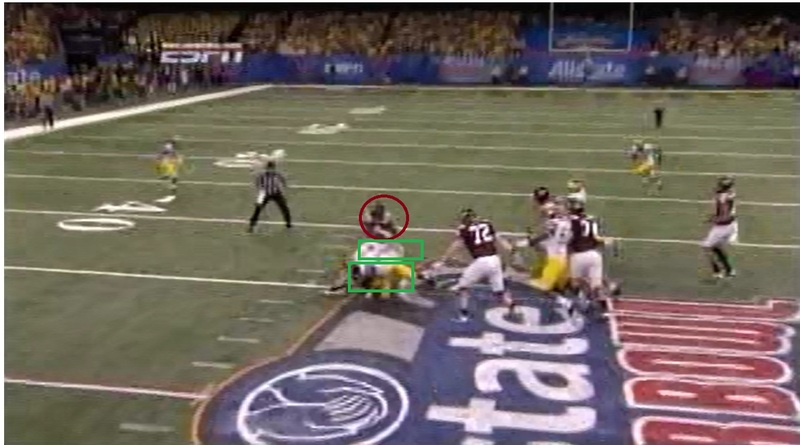 See the narrow green scribble near the sideline? That's what's left of the cornerback after Wilson set up that guard's block masterfully. See that orange circle? That's David Wilson introducing the Michigan defender to his forearm. It's the tool Wilson uses to successfully get the first down. The pad level and use of his inside arm to deliver a blow to finish the initial collision with the shoulder was physical in the way that Walter Payton or Adrian Peterson got physical with defenders in space near the boundary. 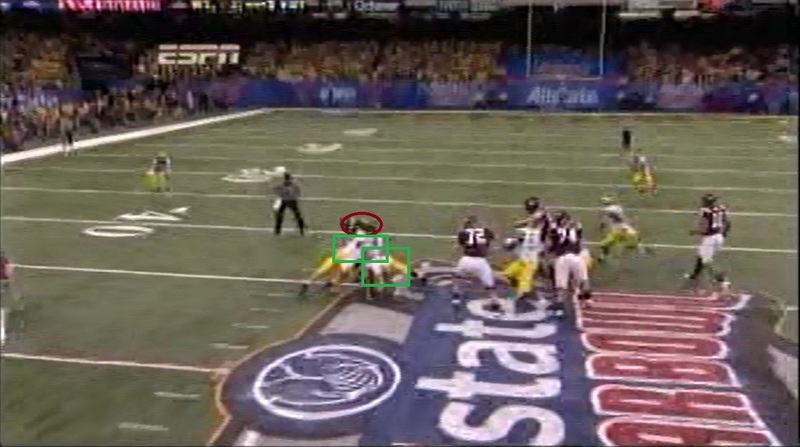 The player in the green square outside the field of play is the cornerback Wilson fooled. The green square around the player prostrate near the boundary is the linebacker that met David Wilson's forearm just four yards earlier. 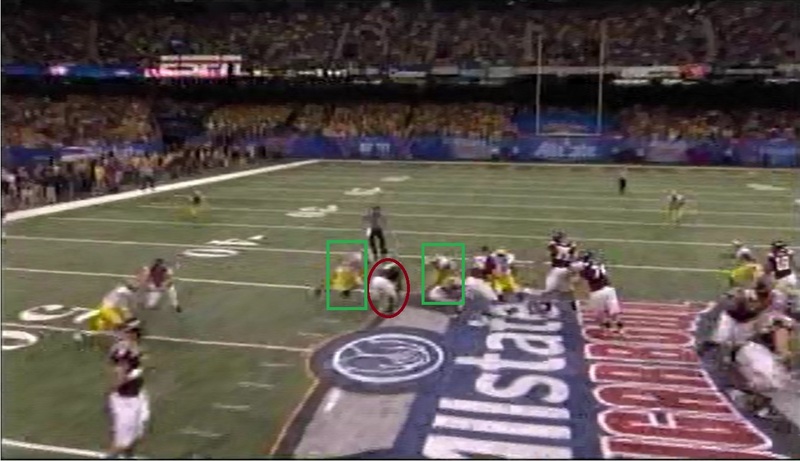 The player circled in red is Wilson getting the first down after performing a successful homage to Adrian Peterson and Walter Payton. This is the type of run Wilson will need to execute frequently in the NFL. Not the exact play, but the kind where he’ll need to balance decisiveness and speed with patience and guile and then finishing strong for extra yardage. In contrast to the the run that I analyzed yesterday where Wilson lost 22 yards, the RB also displayed decision-making that NFL teams expect from a future starter. An example is a four-yard gain on the very next play after the one I just analyzed: a 1st and 10 with 9:17 in the third quarter. 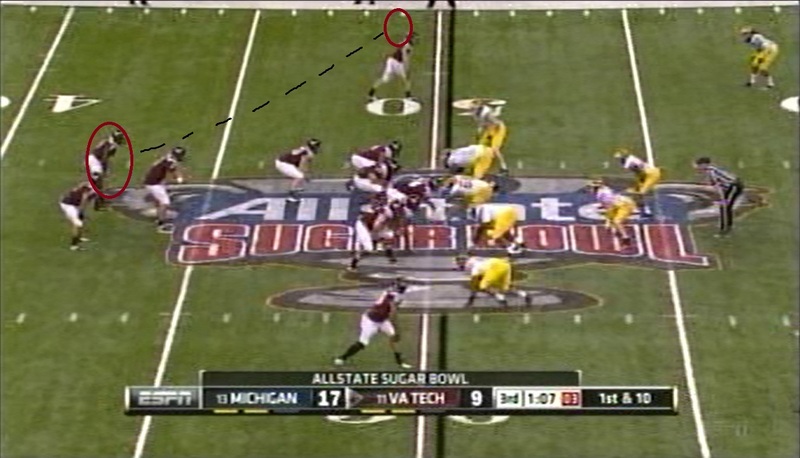 Wilson begins the play in an 11-personnel, 1×2 receiver set against a 4-3 defense with the WLB in the slot. Wilson runs behind the left side of the line collapsing the defense. First there’s the LG-C double-team of the LDT to the inside and then LT knocking the LDE to the ground and moving inside on the LB at the next level.Wilson follows the play as designed despite the absence of a large crease. As he reached the line of scrimmage you can see him prepare split both linebackers with good pad level to take whatever he can get. Sometimes the best runs are the simplest. Four yards on first down makes offensive coordinators and quarterbacks happy. Keep them happy and a running back remains well-fed. Then note the power of his legs combined with good pad level to split the SLB and MLB for another yard or two, nearly busting loose from both defenders in this series of frames. 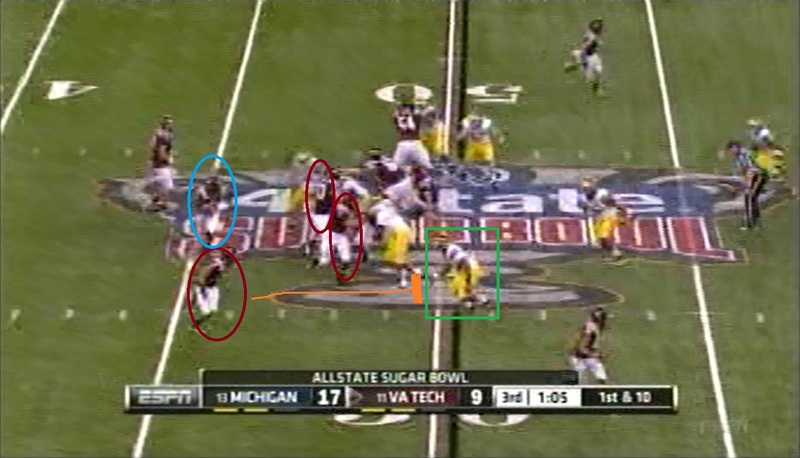 Here's a better view of the left side of the line collapsing the UM defense inside. 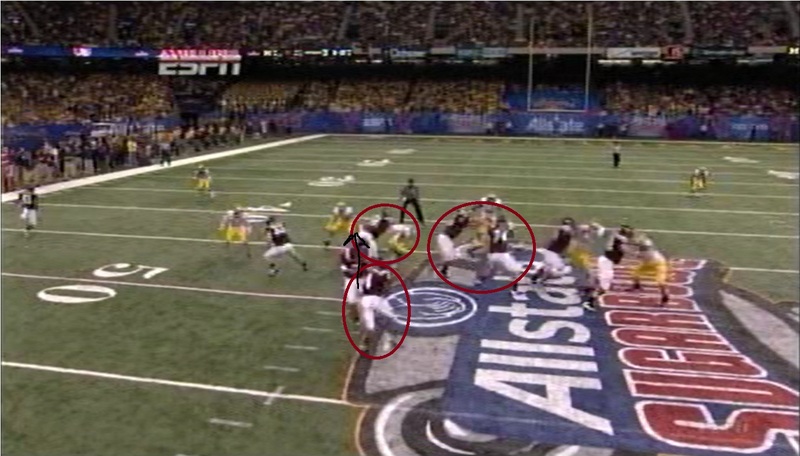 Note the LB that came from the right is on the ground behind Wilson and the LB from the left is holding on for dear life. Wilson nearly twists free from the LB for extra yardage, but four yards is more than enough. It’s a good, physical, and technically sound run that takes what the defense gives to keep the chains moving – simple, but effective. Wilson’s final carry of the third quarter was only a one-yard gain, but he resisted the temptation to exacerbate the situation. The play happens on 1st and 10 with 1:10 left from an 11-personnel, 2×1 receiver pistol set. Wilson motions from wide receiver to the backfield and flanks the QB’s strong side. This transforms the 11-personnel to a 21-personnel, 1×1 receiver pistol set. The play design is a run to right end. Wilson motions from wide receiver to the backfield. 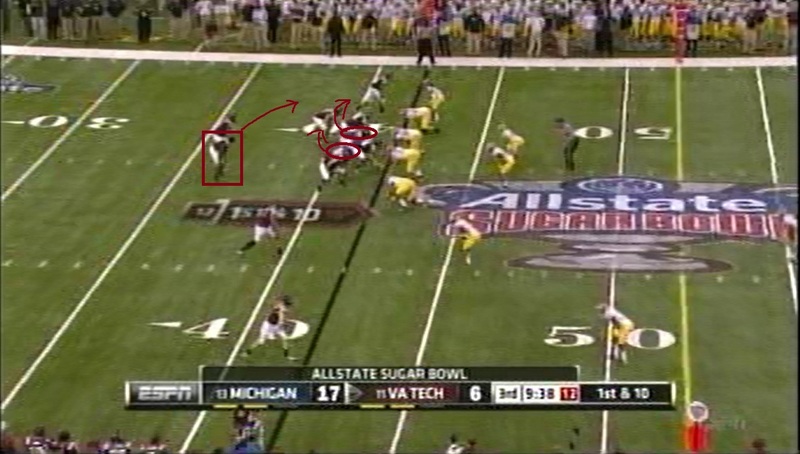 In the first half Va. Tech motioned Wilson from WR to RB on a jet sweep, and an option pitch. 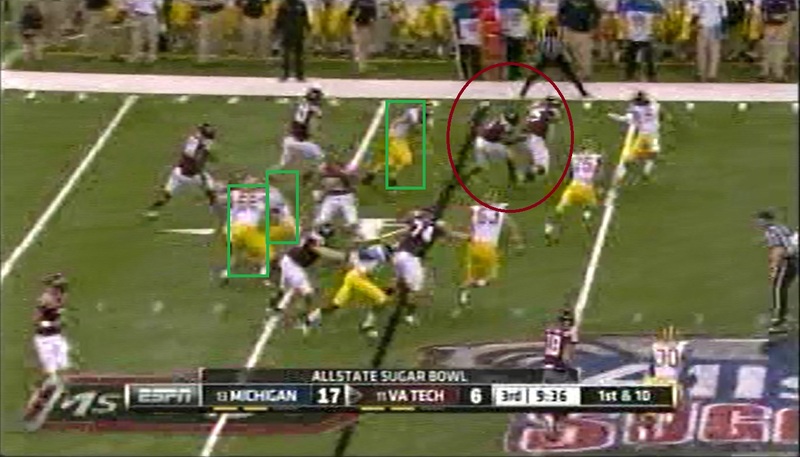 This time it's a traditional hand off to right end behind the wing back (TE) and LG pulling across the formation. Once Wilson takes the exchange behind his wing TE with the LG pulling to right end, the RDE gets penetration into the backfield unchecked. 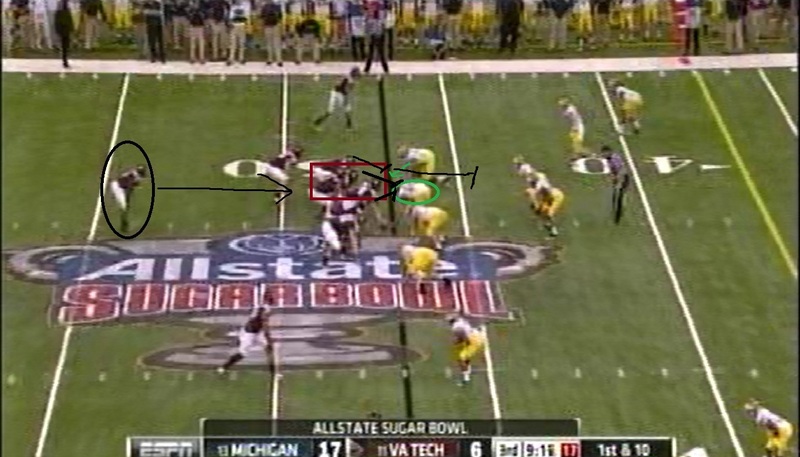 The DE boxed in green is unchecked because the lead RB should have blocked the defender, but doesn't. This forces Wilson (in the blue circle) to cut back to the numbers. See below. This unblocked penetration forces Wilson to cut back to the numbers just as he reaches the flat. See the LG circled in purple? If the lead RB blocks the DE, the LG would have been able to peel off his original block to teh LB inside the right hash at the 47. Instead he has to take on the DE. I also draw where the lead back was supposed to go and where he ended up. The result is conceptually as messy for Wilson as I made this diagram. He cut back into the backside pursuit and was dragged down by the LB at the ankles just as he reached the line of scrimmage, extending his body for one yard. Wilson cuts inside and takes whatever he can get, spinning through a wrap to the ankle a few steps later to get positive yardage. It was a good decision by Wilson in a bad situation and a good indication that he can accept when the defense has limited his options and he must max out what’s directly in front of him. Or, at least he’s learning on the job. What I think fans sometimes don’t realize about evaluating running backs is that its often the boring or unsuccessful plays that speak louder about a prospect than the gaudy plays on YouTube highlight reels scored with the latest Hip-Hop track. Tomorrow: I’m examining other successful runs from Wilson in this game, but these plays also appeared to be attempts where Wilson might have left yardage on the field. I’ll let you decide. Thanks Ron, I appreciate the sentiment. As a diehard Hokies fan, I agree that Wilson’s 22-yard loss on that first-and-goal play against Michigan is the best example of his flaws. Too hyper, and not enough maturity to accept that that play was doomed but you still have three more downs. But keep in mind that that was his first year as a starter, and despite his flaws and lack of experience he gained over 1700 yards. But while you can coach a kid to have more patience and learn to wait on, and follow, his blocks, you can’t coach speed and balance. And Wilson has 4.2 speed and a gymnast’s balance and body control. And the thing about Wilson is that he is a goal-oriented young man who challenges himself to get better every year. That horrible run against Michigan might be the definive example of how raw he is, but it doesn’t define his skills, or his character. I think this series pretty much encapsulates what you said.